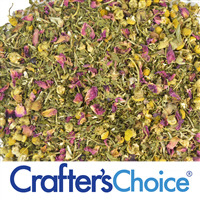 Each bag holds 1 Tablespoon of the Crafter's Choice Bath Tea. COMMENTS: These works wonderfully for infusing my oils for my homemade products. COMMENTS: I purchase both sizes of these Bath Tea Bags and they are both very good sizes and sell extremely fast. Also very easy to seal. COMMENTS: I bought the larger tea bags and they sold like hot cakes, I went to buy more and they were sold out at the time so I figured I’d get these. I love ‘em! So easy to use and I can make bath teas, shoe refreshers, small potpourri satchels... still love the large ones, but I’m glad i got these too! "Great Little Bags for Bath Teas"
COMMENTS: I used these bags to package my bath teas. Love them. I was surprised how long one of these lasted in the tub! "Very difficult to open for filling"
COMMENTS: All of the five-star reviews prompted me to buy these tea bags, but I find them very difficult to use. In fact, they were so hard to open for filling that I sent an email to customer service thinking I had a defective batch that was already sealed. The representative told me, "You rub the top a little to let it open." That is a vast understatement. It took at least 30 seconds of vigorous rubbing to break the seal on a corner, then I had to pry the rest of it open, hoping not to tear the bag in the process. What I hoped would be a quick fill-and-seal process will instead be almost too time-consuming to bother. COMMENTS: I love these little tea bags for giving out samples of herbal bath tea & salt blends. They seem easy enough to use and the price won't break your budget. They also make great little sachets placed inside of an organza or muslin bag! "Opened easily first time I used them"
COMMENTS: The first time I used these, they opened easily once I put them in the oil to infuse some oil. I did check to see that I had sealed them correctly and I had and they were not coming apart of loose but they did fall apart. Second time around, they stayed closed. Only put a little bit of herbs, powder or whatever your putting in there. No point in over filling them as that will cause it to come loose. COMMENTS: Made 100 bath teas for a local non profit event. They were the perfect sample size and so easy to work with. Love them! Only problem was sometimes they wanted to tear a little to far when trying to separate them. Just take it slow and careful though and it's fine! COMMENTS: I needed these bath tea bags for my balth salt blend and the came in handy. It was a little difficult getting the opened but I wet my finger a little each time to get it to open. Other than that, I live them and will be ordering more. COMMENTS: I would definitely buy this product again. COMMENTS: I've used these to infuse oils. They are awesome. So much easier to take out a bag than strain out plants. I have had no problem with them leaking or not sealing. Excellent product. I've also thought they would be great to make bath teas but have yet to try that out. COMMENTS: These are awesome little tea bags for bath teas. A non messy spa experience. COMMENTS: I used to make my own, but this is so much easier. "easy to use and simple." COMMENTS: Originally I wanted the 5x5 bags and ordered these by mistake. so while they don't fit my purpose for bath soaks. they would be perfect for sample packets of soaks and salts. I use these as a quick fix for the loose leaf tea I Buy from work. as well as dissolving sugar and salts into soap waters. no need to stir stir stir!! No need to strain out clumps if my water gets cold quickly. • they don't stain from herbs. COMMENTS: I had a hard time getting these to actually do much due to how small they are. I put two in a bath with my bath salt blend and I didn't get much out of it. I think these are too small to be used with flowers and salts. Maybe with a plain bath salt recipe, you'd be able to fit more in it. COMMENTS: I actually use these tea bags to encase lavender buds and then felt them into a dryer ball. The bags are very strong and seal easily with a hot iron. COMMENTS: I used this to make bath tea bags. They held up well during the soak test. Customers love the convenience, drop and soak. COMMENTS: Use these for both bath seas and salt soaks. Very easy to use and they close up great, no issues with loosing seal once in the water. "Bath Tea Bags - Small"
COMMENTS: Yes, these are small. Before purchasing, get out a ruler and confirm that you know exactly what size you are getting. I am using WSP's recipe for shoe and boot deodorizer and selling these for shoes. I'm also giving away as freebies to generate business for the whole package of deodorizers. I presently have one under my seat in the car as well as in my lingerie drawer and it smells very nice. To open, it's the long textured side. Rub that side between your thumb and finger to open. Seals very nicely with my table top impulse sealer. COMMENTS: These are the perfect size for my bath teas. It fits a half ounce of my mix easily and they are quick to seal. I love using them. "Bath Tea Bags (2.5" x 2.5")"
COMMENTS: Great little bags and sealed easily on a warm iron setting. I used them for linen drawer and closet potpourri sachets for personal use. COMMENTS: I actually use these to infuse my natural colorants into oils. For example: I'll take some alkanet root powder and put it in the tea bag and twist the top and place that in my oil to infuse. these work perfectly. COMMENTS: These little bags are just great for sample for lose bath fizzies and my lavander milk bath. I give out 4 bags for 2 uses and once my customers try these they always come back and want the biggest size I have. COMMENTS: Loved these tea bags! So easy to seal and are great for my bath teas! COMMENTS: I should have gotten the larger ones, but these worked fine for my bath tea samplers. I put 4 in a pkg. they sealed nicely, but you have to be careful ripping them apart. The side tear easily. COMMENTS: These bags were great for my bath salts. They closed perfectly when ironed closed. They did not reopen. I will be purchasing them from here in the future. COMMENTS: These things seal wonderfully and hold up well in the bath. Filled with the bath teas. Will definitely buy more! COMMENTS: I wasn't impressed with these. I followed the directions, but still had way too many split open after they were sealed. They're much too delicate for my taste. COMMENTS: These are so very easy to use...Love them so much I will continue using them in my product line. COMMENTS: These bath tea bags are super simple to use and so nice when filled. We make these in several different scents and our customers love them! Everyone likes the idea of steeping themselves in a relaxing bath at the end of a long day! They are perfect in the fact that the mess is all contained in the tea bag so no clean up afterwards. COMMENTS: I simply love these. They are so easy to use. I use the smaller ones for sachets and mini bath tea bags and the larger one for bath tea bags (you need more than one if you use the smaller size). You just fill them up, press the iron and you are good to go and package as you want. I had a few bags that I had to iron more than once as they would not close but they did in the end. My customers love them. They make great hostess and teachers gifts and stocking fillers! COMMENTS: Just ordered the small bags for the first time and must say that I am very pleased. Easy to use and takes a few seconds to seal with a household iron. I used then to make bath teas. Will order again as they make great gifts. "Bath Tea Bags a HUGE HIT!" COMMENTS: These are adorable when useed for bath fizzies. They are the size of a Lipton tea bag. They hold one tablespoon of tea or your baking soda and citric acid with a spoonful of Crafter's Choice tea. They are very easy to use and I also use the larger bags. Just stuff whatever you want into the bag, tey are sealed on three sides and you seal the fourth with a household iron on low setting. So easy and even your kids will like helping with the bag stuffing. A very unique product when finished!!! COMMENTS: These bags are perfect for my hand-blended bath teas. It's a snap to iron them shut and the seal on them is great and holds well. COMMENTS: Just fill your favorite ground flowers or herbs in the bag and seal them and directed. Put them in oil to bring all the properties into the oil by soaking it for a day or two. The oils I use for soaps, lotion and also for massage. • It saves me from the mess. COMMENTS: These are absolutely wonderful! I filled them with my favorite bath salts, ironed them closed, and voila! the perfect way to put a bath tea into your tub and not have to rinse out the mess afterward! "Bath tea bags- easy and perfect!" COMMENTS: I make baby bath teas as well as bath tea bags for adults with these. They are a customer favorite. The bags are just the right size and super easy to seal shut (I use my hair flatiron). COMMENTS: I really like these tea bags.I have bought them the past 2 years and I love them. easy to fill and seal. Process goes very quick. COMMENTS: These are great for holding teas and infusions. I filled mine with lavender buds and soaked them in olive oil infuse. Easy to just pick up out of the oil and toss. No mess and no residue in the oil. COMMENTS: A great addition to my product line! COMMENTS: I used these to make my bath teas and they were a hit at the baby shower. "Love these to infuse natural colorants"
COMMENTS: We place the herb in the tea bag, tea bag in canning jar and set a sunny window. No need to strain. Love it! COMMENTS: These bags work like a dream and are very easy to use. COMMENTS: I had ordered these to use with herbs, salts, etc for tea baths but found that they are too small for the average amount required for "beneficial" bathing. Good for samples and bath scent. Simple to use. Too small if you want to add enough for therapeutic use. COMMENTS: My primary use for these bags (not available for selection above) was bath teas. I used a tablespoon of botanicals, seal the bag with a hot iron and they were done! Great product. COMMENTS: These bath tea bags work so well. They seal easily and are great in keeping the bath tea mixture contained. I like this size for samples and they also work well for single uses. If people aren't sure about purchasing the larger size tea bag, this one is easier for them to try. COMMENTS: These were super easy to fill and seal. I used my flat iron to heat seal the ends after filling them with bath tea. Will buy again. "Better than what I expected"
COMMENTS: Work perfectly for bath teas. Seals very easily with a household iron. No complaints! COMMENTS: Just started using these and love the smaller size as well....these work really well for my bath teas and are the perfect size for single use. COMMENTS: These are very cute and easy to use. I got the large ones and these are a great addition. So easy for small samples and batches to mix and match bath teas. Also in that they are small it looks nice when they are full. I use natural crochet cotton thread to tie on my labels. COMMENTS: My first time making bath teas and easy breezy. Quick fill and easy seal. Coming back for more. COMMENTS: I love these tea bags. Bath tea is a fun project and super easy. They are a really good seller for me also because they are unique and not everyone has seen them elsewhere. There are many possibilities for what to fill them with and I'm constantly trying out different stuff. COMMENTS: These little tea bags are quite strong and they seal very easily with an iron! They make great little party favors. Some bath tea blend contain sharp, large pieces that will poke through the bags so I suggest crushing larger pieces before putting them into the bags. One thing that would be nice is if WSSP offed something in between the 50 and 1000 quantities. "Easy to use and A Customer Favorite..."
COMMENTS: These are a must have for any bath and body shop. For those folks that like all natural essential oil items, this provides a fantastic way to package WSP's Bath Tea Varieties or your own perfected recipe!! Easy to iron closed. "Perfect size to use when Infusing Oils"
COMMENTS: While the opening can be difficult, I just have to be patient when adding what I want into the tea bags. I have used this size when I am infusing oils so that it is less for me to have to strain as well as scented teabags. I will buy the larger sizes for Bath Teas. These are perfect for what I wanted them for. COMMENTS: I bought these and also the larger size. I used this size for "freebie samples" and enclosed one in each order. The customers loved them, which made them come back for more in the larger size for purchase. These are a blast to make too. So easy to use. Makes ironing fun again! COMMENTS: I tried tea bags from another company. Then I bought samples from here. I then ordered a ton more. Great results! COMMENTS: I brought this product to use in our bath teas. They are excellent and can be packed full of your herbs and flowers. The sealing is also easy too. "PERFECT FOR PACKAGING BATH TEAS!" COMMENTS: Easy to use, and this large size is just right for holding about 0.8 oz of a Bath Tea with Sea Salt mixture. I have used it for the WSP Basic Tea mixed with Sea Salt, which I have scented with Lavender oil mixed with Tapioca Starch. Easy to seal with a flat iron, or shrink wrap sealer. COMMENTS: These are great and very easy to use. I am very happy that I bought these. COMMENTS: no problems at all with these! I use a table spoon to fill these, one side to open the bag-the other side to insert the contents! COMMENTS: These little bags are fantastic. I used a little over 2 cups of muscle relaxer bath tea to fill 50 small tea bags. The are very cute packaged in the 3x4 clear zip bags (2 to a bag), with a decorative sticker at the top of the bag...my friends are crazy for these things! COMMENTS: These bags are excellent to make Bath Teas and looks so finished and professional. COMMENTS: And so easy to use! Perfect for making bath teas! And EASY to package for sale! "What are these bags made of?" Staff Answer The tea paper is made of a special blend of thermoplastic fibers, abaca, and cellulosic fibers. "What labels would I use for these tea bag? " Staff Answer We recommend using the 2" x 2" labels we offer. They are available in clear (F12), kraft (B1) and white (K12). "I usually use a flat iron to seal similar packets. This says a household iron on low. What temperature should I set my iron to?" Staff Answer We recommend putting your household iron on low to medium setting. If it is too low it may not seal the tea bags. "the directions state that the tea bag is open on 1 side and sealed on 3 sides. The bags that I recieved all 4 sides are closed, am I supposed to cut 1 end open to fill the bag and then iron closed"
Staff Answer There should be one side that is open but it may not be the side you would automatically think. Three sides look the same and one is different. The opposite end of the one that is different is actually the open end. Please give our customer service a call if all sides are sealed. "Is there any reason why these cannot be used for regular tea bags for drinking?" Staff Answer Our warehouse and repackaging facility do not meet FDA standards for a food repackaging facility. We cannot and do not recommend using any of our products for consumption or for use in food preparation. "How many ounces/ teaspoons would you put in a tea bag? This is a new offering that I would like to do for my business! Please advise! :D"
Staff Answer That will depend on what size tea bags you use. 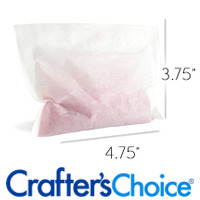 The 2.5x2.5 bags hold approximately 1 TBS and the 5x3.75 hold approximately 1/2cup. "If I used a powder like colloidal oatmeal in these bath tea bags would it come out of the fabric itself if pressed? " Staff Answer Since Colloidal Oatmeal is a fine powder it is very likely that it will seep through the bags if they are handled too roughly. "Are these bags heat resistent? I am trying to make sachets w/lavender buds for the dryer?" Yes these bags are heat resistant. You can use a iron to seal them after adding your lavender buds. "Are those tea bags biogradable?" Staff Answer Our bath tea bags are not biodegradable. "I am looking for some tea bags to use for my chamomile tea. Are these considered food grade and can they be use in hot boiling water?" Staff Answer Our products are made for cosmetic use. Our facility is not FDA approved so there is a possibility of cross contamination with other cosmetic products. Therefore, we do not recommend using these for food/ingestion. 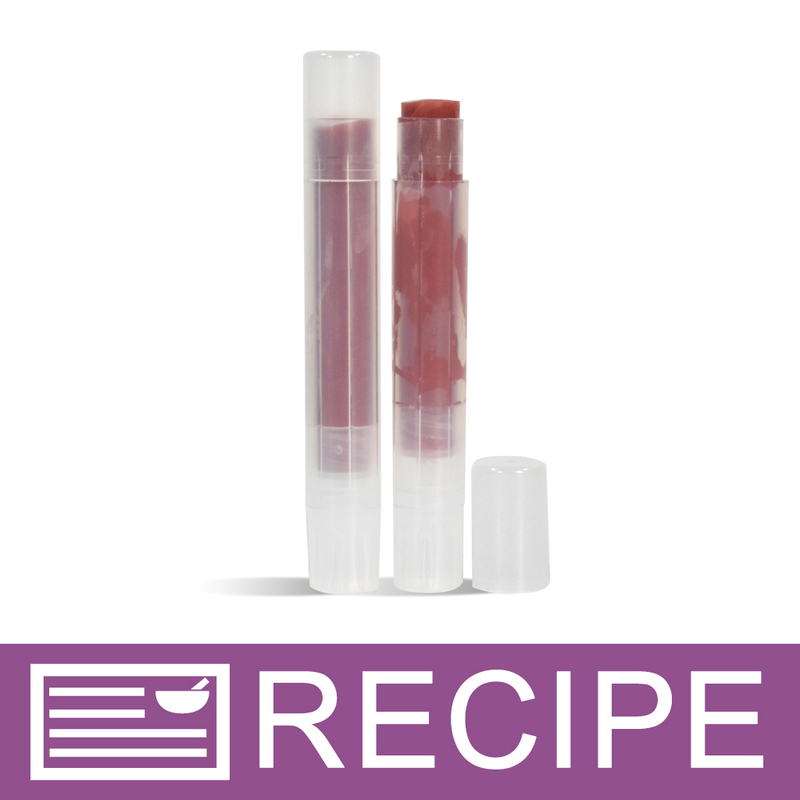 "Do I want to add some tapioca modified starch to this blend + essential oils, or is it ok on its own? If so, how do I add oils to the mixture without spoiling the herbs and flowers? Is that what the tapioca is for? What is the process? " Staff Answer Adding oil directly to this product may cause mold and/or fungal growth. If you desire to scent the bath tea with fragrance or essential oils, we suggest making scented bath salts with Tapioca Starch-Modified. Once fully dried, blend with the bath tea and this will help to prevent any mold or fungal growth. "Can these be used for bath melts so my lavender buds don't get everywhere? " Technically yes you could but a bath melt in these to keep your lavender buds in. However the oils in the bath melt will cause the bath tea bag to have a wet greasy feeling versus just being wet. This could be a hazard so I would not sell this product. If you are planning to use it for yourself then it should be okay. "how many oz of the flower leaves would you put in here"
Staff Answer I would start by trying 1-3 teaspoons. It is important for it to look full but not bursting full. I don't think you can use a blanket "ounces" when using these bags. Instead, slowly fill the bag a bit at a time until it is to your desired level.